As a Registered Dietitian I like to keep abreast of what is trending in the field. I love to experience new foods and try out new ideas. My husband often needs some coaxing in trying new things though as is true with much of the public – it’s kind of like a toddler who is going through the stages of “picky eating” and “food jags”. I use the same principles – offer a new food with other favorite foods, ask for a “no thank you” bite and don’t make an issue of food choices – just offer a variety of healthy foods to choose from! Kale and chia seeds are the craze. Kale and chia seeds are unarguably two of the hottest superfoods as of late. Just look at these health benefits of chia seeds! Belief in the “wheat belly”. Regardless of the conflicting evidence to support wheat-free and gluten-free diets for weight loss, Paleo and gluten-free diets will remain the most popular among those looking to control their weight. Gluten-free diets also help those suffering from inflammatory diseases like rheumatoid arthritis. 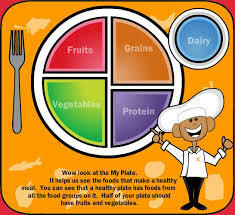 We’re using MyPlate to fill your plate. Thank goodness the Food Pyramid finally crumbled because quite honestly it was confusing even for us dietitians. This year we’re all about using the USDA’s MyPlate to help teach you how to fill your plate with more nutritious foods. Local & sustainable foods are favorable. These were the two most trendy terms among consumers shopping for groceries. Being more comfortable the weigh you are. The number of consumers who are comfortable with being an “unhealthy” weight seems to be on the rise this year. Many people remain healthy even while carrying extra body weight – maybe the “big bone” theory has some credence! The low-fat trend is finally fading. Consumers are adding more fat back to their diets since recent studies have shown that “low fat” doesn’t necessarily lead to less body fat. Breastfeeding is on the rise – YES!! Women are overcoming the mass media of huge formula companies pushing their product and going with the natural and best way to feed their babies. Fruits and veggies first. Eating more servings of fruits and veggies was ranked the most important diet tweak to improve overall health this year. Using low carbohydrate squash in place of pasta. Spaghetti squash and zucchini make wonderful “noodles”.